September 25, 2017 – This week, our time machine follows one woman’s modern quest to recover property stolen by Nazi Germany. It was only a single theft in the National Socialist State’s vast, systematic plundering of Jewish wealth, but the Wolff family’s story quickly becomes our story, and we find ourselves rooting for justice. 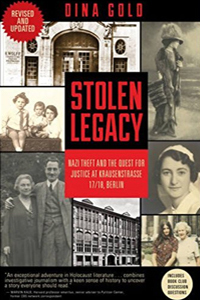 Dina tells the story in her book, Stolen Legacy: Nazi Theft and the Quest for Justice at Krausenstrasse 17/18, Berlin . Raised in the U.K. and is now an American citizen living in the nation’s capital, she sits on the board of the Jewish Community Center and just completed her stint as co-chair on the council of the Washington Jewish Film Festival. A senior editor at Moment magazine, she started her career in London as a financial journalist after postgraduate studies at Corpus Christi College, Oxford. Later, at the BBC, she worked as an investigative reporter and television producer. Learn more about this story of a generational quest for restoration online at StolenLegacy.com, and follow her on Twitter @Dina_Gold and at @Stolen_Legacy for the book.